When Air Force Master Sergeant Swann was deployed, as he was for tours in both Iraq and Afghanistan, these calls would come in three times a day. A land mine had been hidden in the sand, or an improvised explosive device (IED) had been stashed in the trunk of an abandoned car on the side of the road. 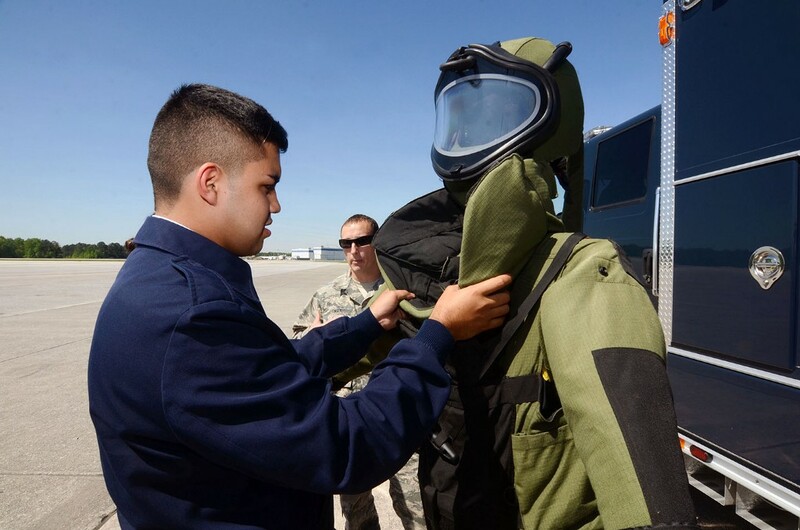 His job, and the job of his fellow explosive ordnance disposal (EOD) airmen, was to put on a protective bomb suit and delicately disarm and remove the (sometimes literally) ticking threat —like a stateside version of The Hurt Locker. Swann grabs his government flip phone and finds a quiet corner. Opening the aged device, he hears the voice of his superior officer. A man was spotted with an ordnance on the side of Panthersville Road, a rural byway just outside Dallas, mere minutes from where Swann now sits. The rest of the information is scant and vague: A military artillery round. Potentially live. This moment — the journey toward an unknown and potentially deadly enemy — is what Swann lives for. “We spend 90 percent of our time training,” he says. 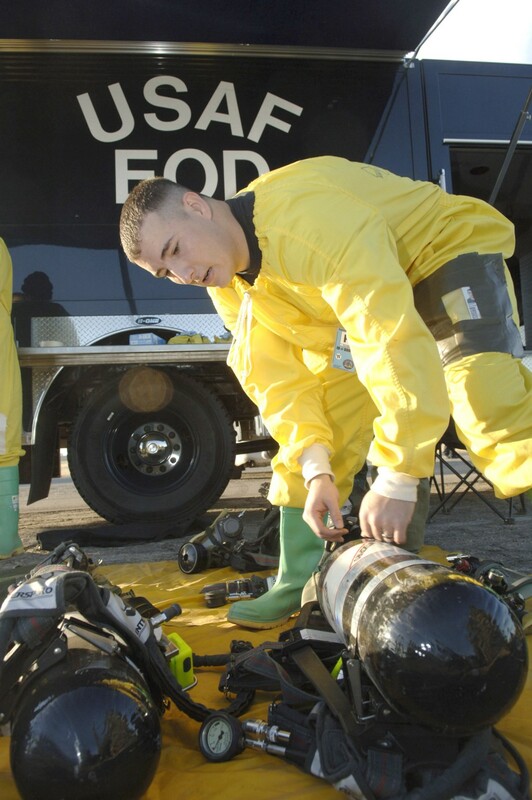 “When the call comes, I’m excited to do the job.” The intermittent exhilaration was enough to entice Swann, the son of an Army recruiter, to choose Air Force EOD straight out of high school and spend six years on active duty. It’s why, after four years of civilian life with the TSA, he decided to come back as a reservist. “I got bored,” he explains. But that’s not to say Swann is an adrenaline junkie — there’s a fine line between thriving under pressure and getting off on it, like Sgt. William James (Jeremy Renner) in The Hurt Locker. “There’s nobody who puts that [bomb] suit on and walks toward that kind of threat who isn’t nervous,” Swann says. 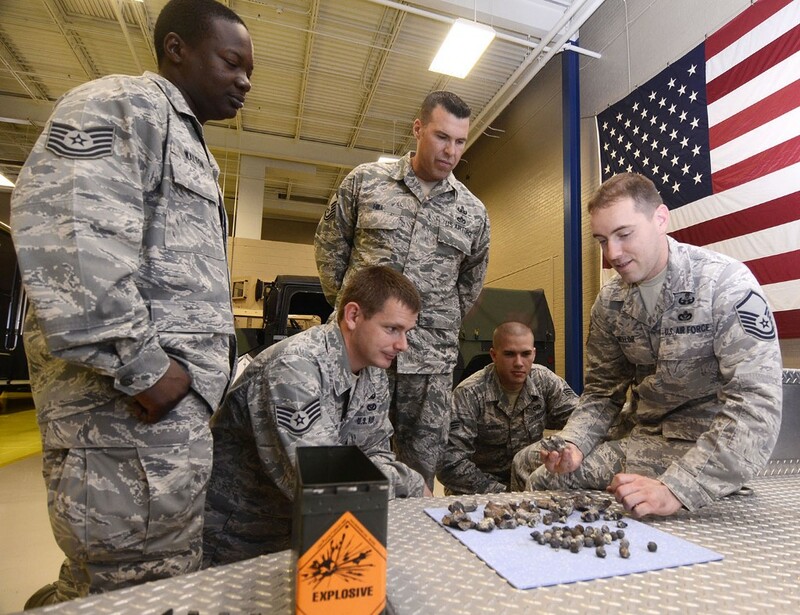 Before an airman is even considered for the Air Force EOD Technical School, his background is checked for signs of emotional instability. He has to pass an eye exam and a physical training test that includes two 1.5-mile ruck marches while carrying 50 pounds. He also needs high scores in the general (math and word comprehension) part of the Armed Forces Vocational Aptitude Battery entrance exam and the test’s mechanical component — 20 minutes to answer 16 questions about simple machines, applied physics and basic mechanics, the likes of which he will be picking apart in the field. Next, he must pass a four-week preliminary course. Only then is he admitted to the 180-day EOD school, where, for eight hours each day, he’s trained in the classroom and in the field on just about every bomb, mine and missile the military has ever encountered — including materials and chemicals “nobody’s supposed to have,” Hill says. “They put as much stress on you as possible,” he adds. “If a guy is shaking with an explosive in his hand, he’s gone that day.” Only one in three students make it to the end. Weapons technology is ever-evolving, so Swann and his colleagues spend most of their days continuing their education on a trove of explosive information and even constructing their own ordnance. The EOD building at Dobbins is itself an armory of inert weapons. Along the walls, there are glass cases stocked with pie-sized anti-tank land mines, artillery rounds of every shape and size and mock-ups of IEDs made out of everything from Coke cans to cordless phones. A couple massive missiles and bombs are mounted for display, while in back, there’s a stockroom of shelves loaded with tens of thousands of different explosive devices for the airmen to study and use as reference. The classified database contains photos and descriptions of hundreds of thousands more — sort of a military-issue Anarchist’s Cookbook. Most major metro police departments have their own bomb squads; so do many state agencies, like the Georgia Bureau of Investigations, and county sheriff’s departments. But when those organizations come across a military ordnance, they’re required to call in their regional EOD unit. Dobbins covers much of the Southeast, from southern Tennessee to North Carolina to Alabama (all of which is, at most, a 2–3 hour drive from the base). 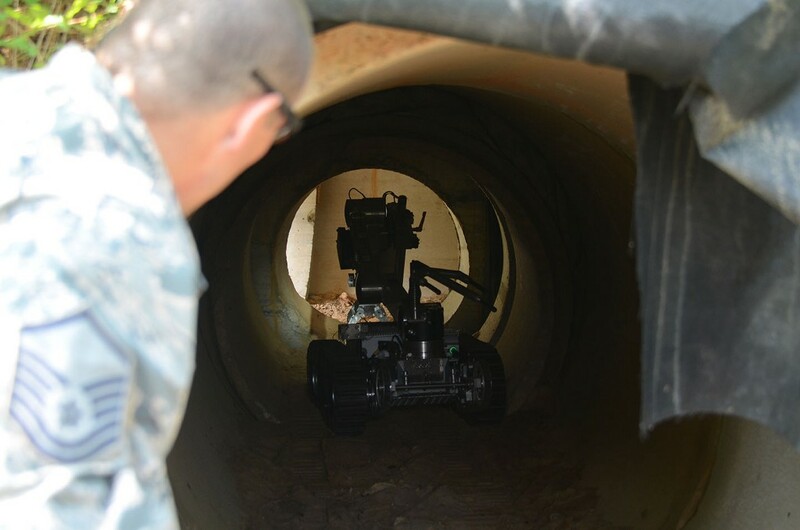 When the call comes in, the airmen on duty need only grab their gear and run to their truck, a portable command center loaded with X-ray gear, bomb suits and two human-sized remote-control bomb disposal robots. Hill says they’re prepared to deploy within 30 minutes of an incoming call; in all, the Dobbins EOD unit fields about 15 calls per year — or a little more than one a month. At times the calls can be almost comical. One man was pulled over with no fewer than six cannonballs rolling around in his trunk; another was using a live World War I-era German artillery round as a doorstop. “A sense of humor goes a long way,” Hill says. On Swann’s desk, there’s a dummy hand grenade with a numbered tag on the pin that reads: Complaint Department, Take a Number. But the laughs only come after the situation is safely resolved. 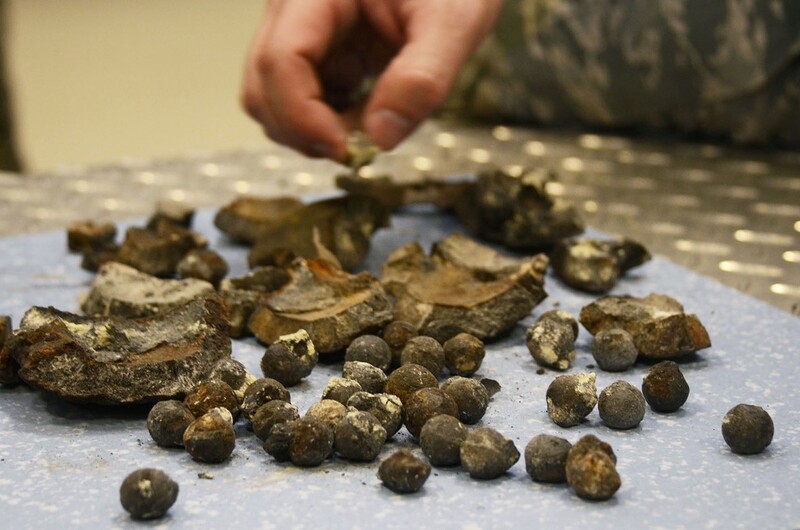 Even though they’re not in Iraq or Afghanistan, even though the pressure is less intense stateside, Hill, Swann and the rest of the airmen know that whether it’s a novel IED or a 250-year-old cannonball, these are weapons designed to kill; until the EOD determines otherwise, they must be treated as potentially deadly. The Dobbins airmen see a reminder of that fact every time they enter or leave their building. In the hallway just off the front door, there’s a combat rifle standing upright, propped between a pair of combat boots and topped with a camo-covered helmet. On the wall above the display is a framed poster with photos of 20 EOD airmen beneath the words: To Honor the Fallen. Just as Swann pulls his Toyota out onto Highway 61 headed north, his flip phone buzzes again. This time it’s a text from an officer at the scene; he’s sent Swann a photo of the suspicious ordnance. It looks like a military round, possibly a projectile about 105 millimeters in diameter — essentially an oversized bullet about the size of a lower leg. Sometimes these digital snapshots are good enough that Swann can read engraved or stenciled letters or numbers that tell him exactly what he’s dealing with. “You might know right away that it’s nothing, which relieves the stress,” he says later. But this image is pixelated and dark. Swann zooms in but can’t make out any identifying markings. It’s definitely 20th-century, possibly Vietnam-era. Whatever it is, it looks fully assembled — the charge still inside the cartridge casing topped with a fuse. Any of these three parts could contain explosives. Based on what he knows so far, Swann is thinking it’s a live round. About 15 minutes after leaving his garage, Swann sees the red lights of two Paulding County patrol cars flashing in the thick-wooded, coal-black river basin. The state police bomb truck has arrived as well. The deputies, seeing an unmarked Toyota, at first try to wave Swann past with the rest of the rubberneckers, until the airman rolls down his window to reveal his face. The deputy recognizes him from a previous incident. With the rest of his EOD crew still en route from Dobbins, Swann is now the man in charge. First, the deputies fill Swann in on the story: Apparently an older man had been sitting at the edge of his driveway trying to sell the round like roadside produce. A concerned passerby phoned the sheriff’s department, which came out and interviewed the man. The budding arms dealer said he couldn’t remember where he had gotten the device (such items are widely available online), but he was told it was inert. A few yards ahead, Swann sees the round standing in the police cruisers’ headlights. He grabs a flashlight from his bag and begins the long walk toward it. This, Swann says, can be the most stressful moment. If he were approaching an IED, he would have no way of knowing how it’s designed, whether there was a remote pressure plate waiting for his boot to trigger the explosion on his approach or someone in the surrounding woods poised to dial a cell phone and detonate it wirelessly. In such cases, he would send a robot or at least be wearing a bomb suit. But since the projectile in question has the look of a conventional military ordnance, the likes of which he’s trained on over and over again, he’s not even wearing gloves. Kneeling over the device, Swann looks for signs of tampering — glue or welding or soldering marks. He gently rotates the round. All he sees is rust. He checks the primer at the bottom of the ordnance and sees the pin-dent that indicates it’s been fired. As Swann picks it up, the fuse falls off and lands on the pavement. It bounces — no explosives. It probably wasn’t even the original fuse. Next, Swann slowly pulls the charge out of the cartridge, which is empty. He now knows that two out of three — the fuse and cartridge — are safe. But the charge, itself, which weighs about 10 pounds, could still be holding its payload. It probably can’t take down a building or even a tank, yet it’s still plenty deadly to anyone in its immediate radius. Swann calls over the state police’s portable X-ray machine, but the round’s heavy steel shell can’t be penetrated. Still unsure of what he’s dealing with, Swann knows he needs to detonate the device. But with cars rolling by, slowing to see what’s going on and homes in the general area, this isn’t the safest place to do so. Swann decides he needs to move the ordnance. It’s around 10 p.m. when the Corolla and state police Suburban pull into an abandoned field some 45 minutes away from the original site. A couple minutes later, Swann’s colleague from Dobbins joins them in the EOD truck. Swann opens the back hatch of the SUV where the ordnance awaits. Swann had determined that, without a fuse, there was no danger of the charge going off on its own. Still, he strapped the ordnance down and cushioned it with blankets and jackets to keep it stable on the bumpy ride. 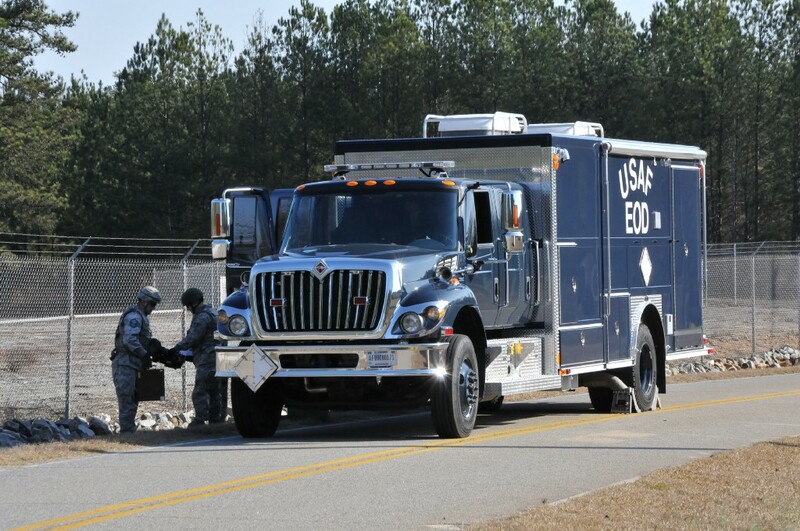 With the EOD truck onsite, Swann is able to look up the ordnance in the database and calculate a blast radius of about 300 yards. He then pulls up the satellite map of the location on his cell phone to ensure that there isn’t a house or a road nearby. He sees nothing but grass and trees. 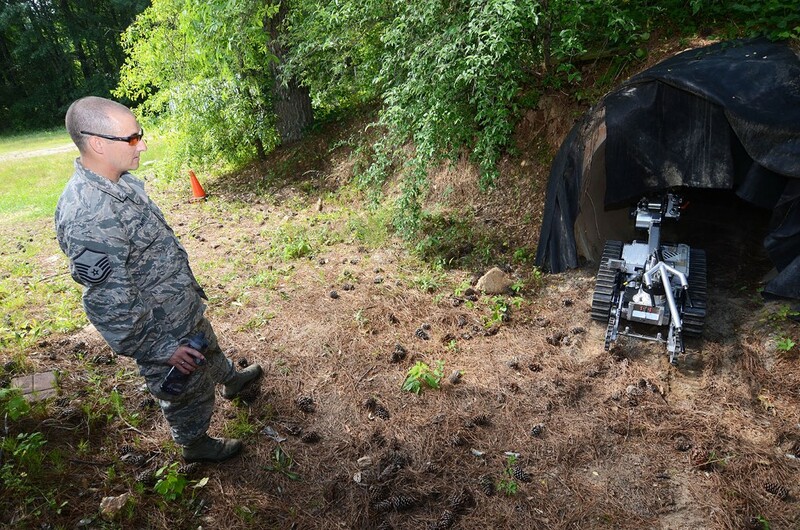 The airmen grab shovels and dig a hole 6 feet into the ground, then gently place the charge at the bottom. While the sheriff’s deputies notify local 911 call centers that they may get calls about an explosion in the area, the airmen pack the round with a little more than two pounds of C4 plastic explosive and run a wire to a blasting machine — a small handheld electronic device. Then, safely out of range, Swann holds down the two fail-safe buttons on the blast machine. After hours of mounting tension, concern and curiosity, the actual explosion is pretty minor (relatively speaking) — slightly louder than a gunshot. But the job is done. Swann climbs down into the hole to verify disposal. He finds pieces of casing lodged in the dirt, telling him that his caution was valid — it was indeed a live round. After calling his wife to tell her he’s on his way home, Swann packs up his gear, climbs back into his Corolla and heads home. He arrives around 11:30 p.m. The house is asleep. After a quick shower, Swann will be, too — he has to report to the base at 10 a.m. But first he plugs the flip phone back into its charger. He never knows when it might ring again. Tony Rehagen is a freelance writer based in St. Louis, MO. His work has appeared in Men’s Health, GQ, USA Today and others. He is a five-time finalist for the City and Regional Magazine Association Writer of the Year award.